... 1817 (195 years ago today, and 28 years to the day after the storming of the Bastille), the author known as Madame de Staël died in Paris. She'd been born in the same city 51 years earlier, and was named Anne Louise Germaine Necker. Her father, a Swiss banker, was Director of Finance to France's King Louis XVI; "her mother, Suzanne Curchod, the daughter of a French-Swiss pastor, assisted her husband’s career by establishing a brilliant literary and political salon in Paris." Germaine, as the daughter was called, was an early light in that salon. She also was married early to a Swedish diplomat -- hence her married name, de Staël -- and separated after giving birth to 3 children. As a young woman, she published letters analyzing the life and work of Jean-Jacques Rousseau, and supported the French Revolution, especially in its early period. Eventually, she went into exile on account of her political views. For the rest of her life, she would alternate between Paris and other European cities, depending on the political winds. Like her mother, Madame de Staël was known for the salons she hosted. 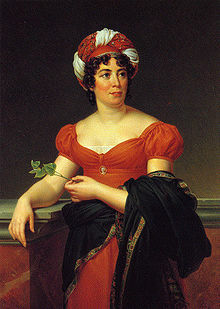 (credit for circa-1810 portrait) Today's she's best known for her writings, including her epistolary 1st novel, Delphine (1802), the sociopolitical message of which prompted Napoleon Bonaparte's displeasure, and so another exile.